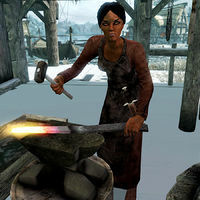 Seren is a Redguard blacksmith living in Dawnstar with her husband Rustleif. They run the town's forge out of their home. She is expecting their first child and is hoping to raise him or her in both Redguard and Nord cultures. If something happens to Rustleif, she will take over the smith full time. She sleeps in her home every night between midnight and 7am. After a one-hour breakfast she follows her husband outside to the smithy where she acts as his assistant for twelve solid hours. At 8pm the couple heads back inside the house and spends the evening relaxing, eating, or chatting. She wears a blacksmith's apron and a pair of shoes. She is equipped with an iron dagger, and carries the key to her home as well as a selection of common loot and gold. If you just arrived in Dawnstar, you will find that most of the townsfolk complain about nightmares, including Seren who will tell you: "Gods I'm so tired." She will also be quick to tell you about her husband and the business they run: "I help my husband Rustleif run the forge. He's a marvel with steel." She may also reveal to you how she met Rustleif: "I married Rustleif when he was in Hammerfell, apprenticing under my father." With the warm deserts of Hammerfell now on her mind, she may then tell you: "The only thing I dislike about my husband's homeland is the cold. Why is it always so cold?" She is expecting to have a child soon, as she will tell you: "We discovered recently that I am with child. I'll need to stop working next season." You can ask her if she does any work on the ships, to which she will reply: "Not much. I came here a few years ago from Hammerfell when I married. The land is beautiful, but I can't stand this cold. I don't know how Rustleif manages it." You can then ask her to elaborate on the fact that she's from Hammerfell, and she will then begin to reminisce about her homeland: "That's right. Home of the Redguards. The land of sand and seas. I hope one day I'll convince Rustleif to take us back there. Until then, I'm content running the forge together here in Dawnstar." If you talk to her when the forge isn't open, she will remind you to come back the next day: "We forge every day if you need anything." Seren: "Rustleif, I've been wondering. Maybe after the baby is born, we should move to Hammerfell." Rustleif: "Hammerfell? I'm not against the idea, but why?" Seren: "I'm just worried about raising a child in the middle of this war of yours." Rustleif: "War of mine? It's not my war, Seren!" Seren: "Your people's war, I mean. The Nords. What kind of life would we be giving our little one if we stayed here?" Rustleif: "I... well, let me think about it." Rustleif: "The forge is hot today." Seren: "Not hot enough. Does your Skyrim ever get warm, husband?" This page was last modified on 8 September 2018, at 17:28.